This article and its photography are contributed by Elisa Parhad, creator of the Guide For the Eyes travel guide series. For more information on Ms. Parhad, and her Guide for the Eyes series, please visit the Eyemuse Books website. 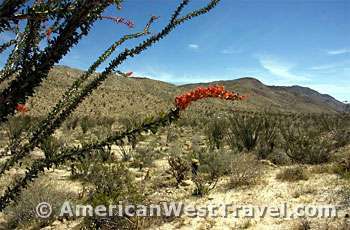 When March came around this year, a familiar nudging had me thinking about Southern California's Anza Borrego Desert State Park. 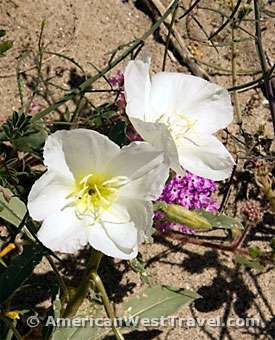 Not only does the desert offer a perfectly balmy temperature for camping during this time of year, but it is also peak time for the park's annual explosion of wildflowers. With El Nino's characteristic rains this year, the highly anticipated event did not disappoint. 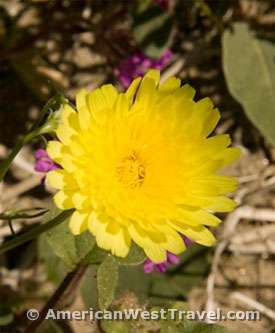 The myriad of small, low blooms blanketed the foothills with a sublime coating of orange, purple, and yellow hues. 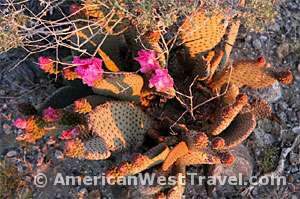 But the wildflowers are simply the icing on the cake in this haven for stargazing, bird watching, geological anomalies, and desert hiking. For the overnighter, one of the greatest features of the park is the ability to camp virtually anywhere within its 600,000 acres. On a whim, I ended up at the Arroyo Salado "primitive" site, in a long wash that begs a 4wd vehicle. 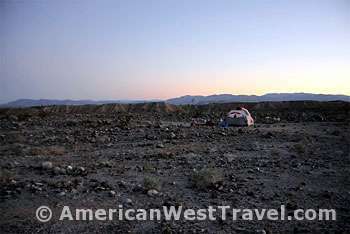 I found a lovely, flat spot up a scalable bluff with views of the Santa Rosa Mountains and the Salton Sea. However, the real show started at dusk, when the night unveiled a glittery magnitude of lights. The next morning I drove Henderson Road to check out a designated wildflower field, but found that the menagerie of large-scale steel wildlife sculptures, citrus groves, date palms, and subsequent fruit stand stole the show. 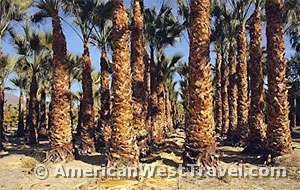 The stand, at the corner of Di Giorgio and Henderson Canyon Road, offers amazingly succulent dates and sweet grapefruit. Well worth the stop. Past the stand off a dirt road is Desert Gardens where I wandered through an oasis of red tinged ocotillo plants, desert lilies, blooming barrel cactus, and cuddly looking browned cholla cactus. Based on my experience from the year before, Desert Gardens is beautiful, but a less accessible version of the short and easy Yaqui Wells Trail, which, with its trail pamphlet available at the trailhead, is the perfect primer for the flora and fauna of Anza Borrego. My final stop, Font’s Point, offered a staggering view of the park’s starkly carved badlands, best viewed at sunset with a cool drink in hand. Having taken the scenic route back home to Los Angeles, the drive home was just as much of the trip as my time hiking and camping. Through the quaint town of Julian (with an obligatory stop for apple pie at the Julian Pie Company) and up north on Highway 79 to Temecula, I witnessed sunlit groves of oaks, blooming chaparral, and the idyllic rolling green hills cattle country. Next year I’m heading back to check out some of the park’s more elusive wonders: a WWII airplane graveyard, and trails that showcase the area’s slot canyons, wind caves, and Kumeyaay Indian pictographs. But I’ll make sure to take a 4wd to get there and buy even more bags of dates and grapefruit at the corner fruit stand. Park Info. 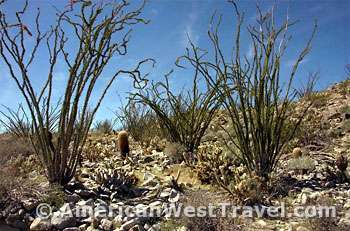 Anza Borrego Desert State Park is located in southeastern California about one hundred miles east of San Diego. It is within the Colorado Division of the Sonoran Desert. The division, located west of the Colorado River, lacks the saguaro cactus, the principal trademark of the main Sonoran Desert. The park is excellent for camping, scenery, hiking, and four-wheel driving. For more information (including park map and area map), visit the official Anza Borrego website. Article and photos, © 2010, Elisa Parhad. Permission is required for reproduction. Visually focused, packed with cultural insight, and sized for portability, Guides for the Eyes celebrate the local traditions and visual vernacular that surrounds us.